What does the term "monster" mean in the world of poker? 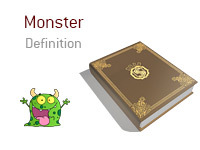 What is the definition of the term "monster"? In poker, a "monster" is a very big hand. For instance, let's say that you are dealt 33 on the button. The action folds around to you. You put in a standard pre-flop raise, and the SB and BB both call. The flop comes 3-3-Q. Now, this is an absolute "monster", as Quads Threes is an extremely strong hand that is almost unbeatable. The only way that you could lose this hand would be if somebody held Pocket Queens and hit a Queen on the turn or the river, or if somebody had a different pocket pair and hit runner-runner to make Quads. Given the way that the hand was played pre-flop, there is practically no chance that either opponent has a pair. While your hand is practically unbeatable, the problem will be extracting chips from your opponents. Your two opponents check, and you put out a bet, hoping that one of your opponents is holding a Queen. They both fold. The "problem" with monster hands is that it can be hard to extract chips out of your opponents, as they will usually have missed the flop.